"This is the story of some brothers whom Nature hadn't dealt the best of cards." Drafthouse Films has unveiled the official US trailer for Danish director Anders Thomas Jensen's wacky black comedy Men & Chicken. Described as an "outlandish hybrid of The Three Stooges and The Island of Dr. Moreau", the film stars Mads Mikkelsen (with a nice mustache), David Dencik, Nikolaj Lie Kaas, Søren Malling and Nicolas Bro. It's about two outcast brothers who get together after their father dies and end up at an island called Ork, where they discover a horrible truth about themselves and their relatives. Pretty sure this won't be for everyone, but if you're into darkly hilarious slapstick comedy from Denmark, you better take a look. Men & Chicken is about a pair of socially-challenged siblings who discover they are adopted half-brothers in their late father's videotaped will. Their journey in search of their true father takes them to the small, insular Danish island of Ork, where they stumble upon three additional half-brothers—each also sporting hereditary harelips and lunatic tendencies—living in a dilapidated mansion overrun by barn animals. Initially unwelcome by their newfound kin, the two visitors stubbornly wear them down until they’re reluctantly invited to stay. As the misfit bunch get to know each other, they unwittingly uncover a deep family secret that ultimately binds them together. 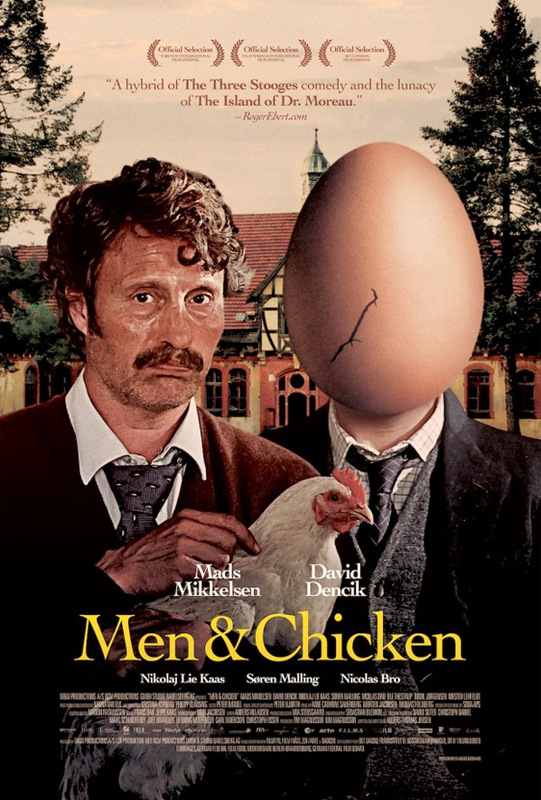 Men & Chicken is both written and directed by Danish filmmaker Anders Thomas Jensen, of the Oscar-winning short Election Night, plus the films Flickering Lights and The Green Butchers previously. Drafthouse Films will release starting April 22nd this spring. If this trailer surprises you that Mads has some comedy chops - have you seen The Green Butchers or Adam's Apples (same director)? If not, I would recommend them. Mads!!! This looks very good. I miss HANNIBAL.